Today many EPSI customers enjoy the benefits of our VMI program. The high price of procurement demands that they embrace a more efficient process, one that reduces total cost and creates value. EPSI’s supply chain and logistics team will help map your existing processes, analyze work functions and recommend changes and improvements. The resulting strategies help drive profitability. With EPSI as your supplier, the products, services and people you need are as close as our nearest branch. We tailor our inventory to meet your requirements. Our expertise in storeroom and inventory management will enable you to eliminate duplicate, excess, and obsolete products. Unlike other companies that simply want to take an order, we work closely with you – like an extension of your internal resources – to solve your specific inventory challenges. EPSI’s VMI program allows you to focus on your competencies while reducing inventory levels, freeing up cash flow and saving time. * Estimated annual savings include projected savings from freight, procurement costs, inventory management, maintenance, setup, bins, shelving, etc. 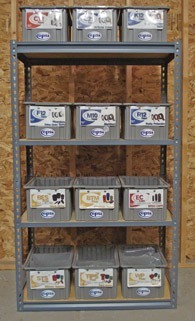 Program includes free 3’ x 5’ shelf, 12 inventory bins and initial setup. For more information about our VMI Program, contact your local EPSI sales rep or Customer Service at the numbers below. Click Here To View a PDF Version of This Page.